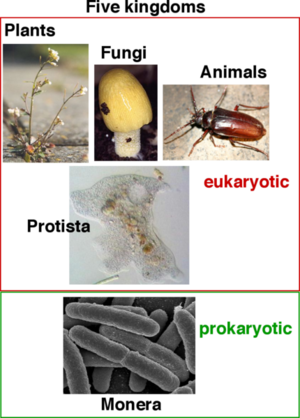 Baraminology is a creation biology discipline that studies the ancestry of life on Earth (biosystematics). It draws from the presupposition that God created many separate kinds of organisms as described in the Biblical book of Genesis, and uses scientific means to determine which organisms belong to the same kind (baramin) and by contrast which are unrelated. Creationist biosystematics enables us to more clearly understand the true evolutionary history of the life on Earth that could not be known from a naturalistic perspective. In 1941, Frank Marsh coined the word "baramin." It was derived by combining two Hebrew words – ברא, bara ("created"), and מין, mīn ("kind"), referring to the use of the word "kind" in Genesis 1 . Although the concept of a created kind became common in creationist literature, a "kind" had not been clearly defined. 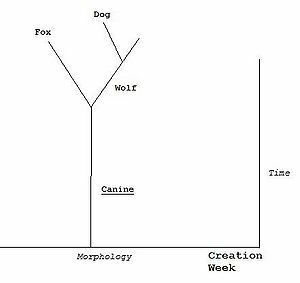 We now understand the kind to be a group of organisms who share a genetic relationship through common descent from an organism originally created by God during the Creation Week. In 1990 Kurt Wise asserted the need for a creation biosystematics—a method of studying, naming, and classifying baramin. It was called baraminology, meaning the study of baramin. Several subdefinitions of baramin were also seen as necessary for discussions within this field. The four terms, holobaramin, monobaramin, apobaramin, and polybaramin were formally and publicly introduced by Walter ReMine at the Second International Conference on Creationism in Pittsburgh, PA 30 July 1990. A diagram illustrating a simplified version of the Canine holobaramin. The branch including dogs and wolves is an example of a monobaramin. The line at the bottom represents Creation week, which professional baraminologists agree is the date of the origin of Holobaraminic developement. Holobaramin (holo-, from the Greek ὅλος, holos for "whole") is an entire group of living and/or extinct forms of life understood to share genetic relationship by common ancestry. It is a grouping that contains all organisms related by descent, not excluding any. For example, Humans are a holobaramin, but a group containing only Caucasians and Negroes is not a holobaramin since it excludes other races. Another example would be Canines, which is a holobaramin since wolves, coyotes, domesticated dogs and other canids are all descended from two individuals taken aboard Noah's ark, and there are no other creatures that are genetically continuous with them. This term is synonymous with the use of "baramin" above and is the primary term in baraminology. Monobaramin (mono-, from the Greek μόνος, monos for "single" or "one") is defined by Walter ReMine (1993, p. 444) as: a group containing only organisms related by common descent, but not necessarily all of them. (A group comprising one entire holobaramin or a portion thereof). It is an ad hoc group of organisms who share common descent. Caucasians and Negroes are a monobaramin, as are any group of a holobaramin such as wolves, poodles, and terriers. Holobaramins contain monobaramins; for instance, wolves are a monobaramin of the Dog holobaramin. Apobaramin (apo-, from the Greek ἀπό, apo for "away from") is a group consisting of the entirety of at least one holobaramin. It may contain a single holobaramin or more than one holobaramin, "but it must contain the entirety of each of the one or more holobaramins within it." (Kurt Wise, 1999–2000). A groups consisting of both Humans and Canines are apobaraminic since both members are holobaramins. The term apobaramin is a term useful especially during evaluations of two types of organisms (pairwise comparisons). A polybaramin (poly-, from Greek πολύς, polus for "many") is defined as a group consisting of part of at least two holobaramins. It may be any of numerous mixtures which could contain holobaramins, monobaramins, apobaramins, and individual specimens. It is an ad hoc group of organisms where at least two of the members must be unrelated. For example: Humans, wolves and a duck are a polybaraminic group. This term is useful for describing such hodgepodge mixtures of creatures. One of the main goals of Baraminology research is to determine the boundaries of the created kinds. Many methods are employed in this effort including traditional classification, hybridization, and statistics . Traditional methods include taxonomy based on morphological features and the use of cladistics within a kind. Successful hybridization is assumed to show relationship within a kind. Statistical methods are especially useful for fossils and include Discontinuity Systematics and the Analysis of Patterns techniques. A creationist taxonomy and classification system is being developed by Todd Elder as an alternative to evolutionary definitions. This includes the Katagenos Species Concept  which attempts to define both species and kinds allowing for a discontinuity to exist between kinds and a continuity to exist within a kind. This also includes the Natanzera Classification System  that retains the binomial nomenclature of Linnaean taxonomy but limits the ranks to the Baramin, Avot, and Benim levels. The Baraminology Study Group (BSG) has been instrumental in this area of research. They are an affiliation of professionals in the biological and related sciences who are actively involved in developing a theoretical framework for biosystematics within creation biology. The group publishes a periodic creationist journal and organizes a semi-regular creation conference to provide a venue for further development in this field. The ability to reproduce is the keystone characteristic which indicates that plants or animals have descended from the same baramin. To aid in the identification of baramin, a database of known cases of interspecies reproduction was needed (for example, lion x tiger = liger). To meet this need, Ashley Robinson and Todd Wood started an internet database of published references to such interspecific hybrids. This important creation science research tool is called the HybriDatabase. The database, which is hosted and maintained by the Center for Origins Research (CORE) at Bryan College, contains nearly 3000 hybrid records. ↑ Elder, Todd. Taxonomy and Classification of Created Kinds Baraminology Quest. Web. Accessed February 17, 2017. This page was last modified on 20 October 2017, at 09:03.